Standard Tolerances ±5%, ±3%, ±1%; available to ±.1%. Standard Temperature Coefficient: ±30 ppm above 1Ω ; ±100ppm .1Ω to 1Ω ; ± 400ppm below .1Ω ; ±60ppm for style LB(4) all values. Dielectric Withstanding Voltage: 1500V AC Minimum. See Temperature Rise and Derating Diagrams Below. 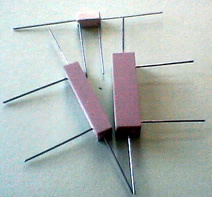 Metal element construction .1Ω and below. Standard Tolerances ±5%, ±3%, ±1%. Standard temperature coefficient ±30 ppm above 1Ω; ±100 ppm .1Ω to 1Ω; ±400 ppm below .1Ω. Dielectric withstanding voltage 1500 AC minimum. Maximum Current = 25 Amps; 16 AWG or 18 AWG leads available for high current applications. Note: Most of the above styles may be ordered with the following options: ( F ) for custom fusing action; (TF ) for failsafe Thermal Fuse Applications (See Below for TF construction).